From "Presbyterian Life," May 15, 1954: "Presbyterians in Detroit." "On vacant lot of neighborhood bordered by industrial plants, a sandlot team from Dodge Community House (rear) gets pre-game practice." Photo and text by Carl G. Karsh. Presbyterian Life listed by name some of the prominent automobile executives who were members of those wealthy churches in suburbs such as Grosse Pointe. It also told readers about relatively new congregations such as the Church of the Master, comprised mostly of industrial working families. Many city congregations faced the question of whether or not to welcome African Americans into their churches. Some congregations like St. Andrews Presbyterian Church “[were] making noteworthy progress in race relations,” despite some initial resistance and departures of white members. The community around St. Andrews had changed in the last decade. By 1954, of the many office workers who had moved in, 60 percent were African American. Rev. Malcolm Sylvester reported that St. Andrews now had 30 black families in worship, but that his congregation still remained almost 90 percent white. 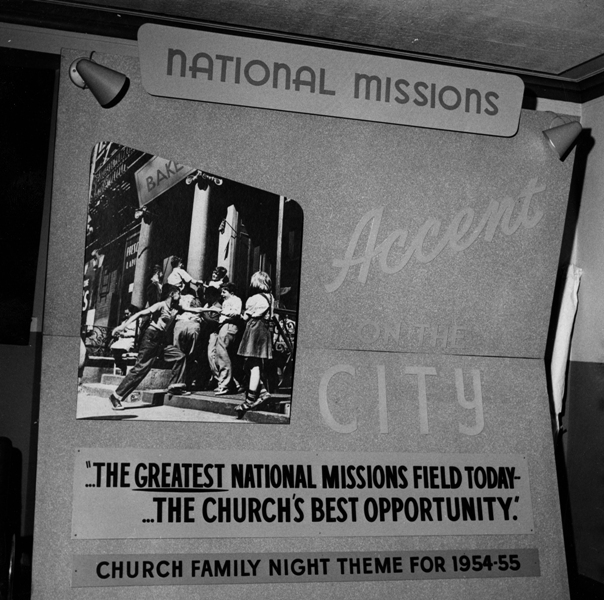 National Missions exhibit at the Presbyterian Church in the U.S.A. General Assembly in Detroit, Michigan, 1954. Leading up to the 1954 General Assembly, the Presbytery of Detroit had reiterated the PCUSA stand in favor of integrated churches and called on congregations in Detroit to minister to all persons in their communities.